This winter, I've discovered a love for statement skirts. Having been someone who never really wore skirts, this is quite a departure for me. I think Boston was the catalyst as I needed a smart/casual option for wearing over there on the days we had singing engagements that led straight into free time. 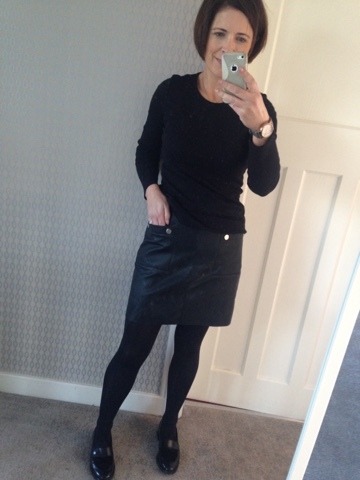 While trying to do my capsule wardrobe, I found a short wool skirt from Marc Cain (in Deja Vu) and realised it looked great with flat black shoes - which are super comfortable and perfect for wearing sightseeing. So that skirt was worn LOTS over in Boston and I really loved that I didn't feel too overdressed - always an issue for a jeans lover. 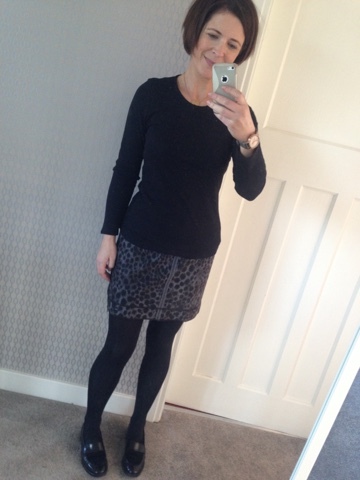 When I came home, I was back in Deja Vu and Ruth showed me the same black skirt in a grey leopard print colour way, which had been left in by the same person. It had to be mine and led to a sudden interest in slightly more interesting skirts. 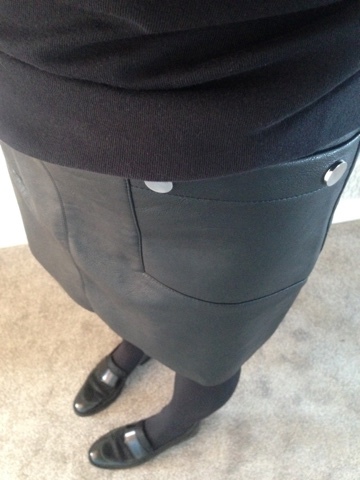 So here's my current collection of statement skirts - all modelled with the plainest of plain black tops/tights...showing just how easy they are to wear. I got this pleather one a couple of months back, inspired by one of my choir friends who totally rocks hers. I've not really worn it as much as I thought I would (outside of choir) but I think that's a thing with pleather - it takes a bit of getting used to. I have plans to wear this more this winter. Finishing with my most recent purchase from Boden. 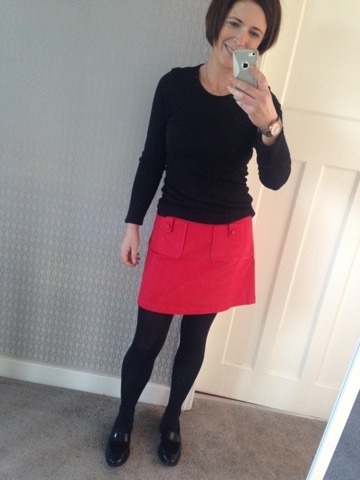 I had a red skirt before and used to wear it quite often but the shape wasn't great on me so I prefer this one and it's perfect for this festive time of year too. 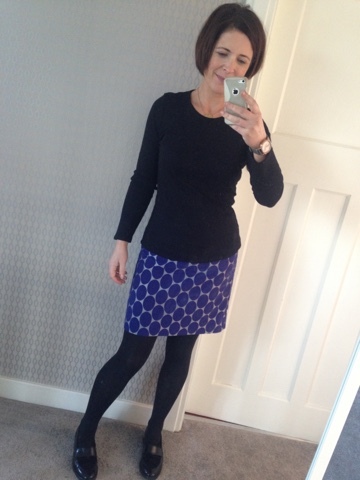 I bought the petite fit as I've quite short legs and I didn't want it to be too long. The material is a soft velvety cotton material so it's lovely and soft. So that's my current collection.....and I won't rule out adding a couple more during the sales :). What I will say is that for me, skirts are more likely to be a cooler weather item. I still can't quite get my head around bare legs with a skirt as short as these - but who knows after a winter of becoming accustomed to wearing them? I should say that the shoes throughout are my Elena Loafers from Seven Boot Lane (size 39). I honestly can't speak highly enough of these. They're so comfortable and get compliments every time I wear them - I think it's the pony skin front detail. Well worth the investment. 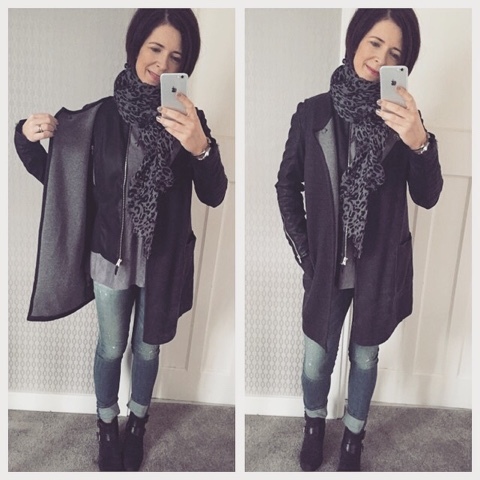 Finishing with a couple of outfits from the weekend. Sunday saw me doing some (more) last minute 'bits and pieces' shopping. I bought this sleeveless jacket in Tipperary the last time I was down and have struggled to wear it since. But I love it over my Lidl faux leather jacket and it was the perfect outfit for a couple of hours in hot shops. 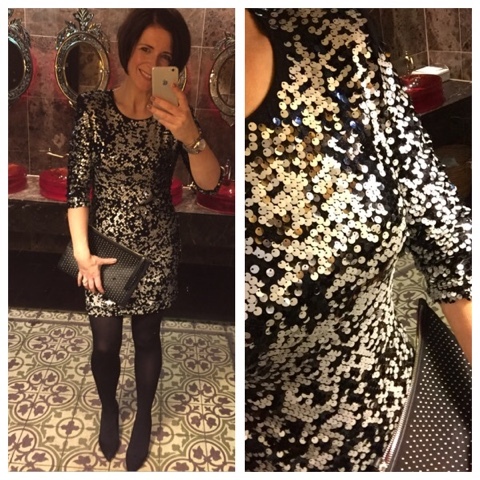 and a going out outfit from Saturday night when my mother in law treated us all to a celebratory dinner in The Merchant Hotel - the only establishment where it's acceptable to take a bathroom selfie (in my opinion!). The French Connection short sequinned dress got another night out with me - its third this month. Definitely a good buy and the current front-runner for New Year's Eve. Hope you're all having a good week so far and there's not too much pre-Christmas stress in the air. I could do with the kids being in school this week I have to say....finding it hard to fit everything in hence I'm on a late night jaunt to Boucher Road in a few minutes. Wish me luck!